Submitted by Larry Hicks on Jun 13 2018 - 9:50am. 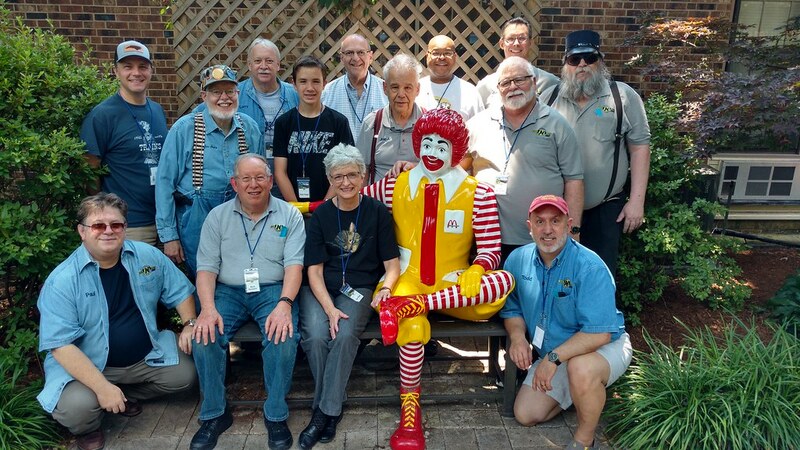 On Saturday May 10, 2018 the North Raleigh Model Railroad Club exhibited a T-Trak layout at the Ronald McDonald House of Durham. This was our first venture at exhibiting at a medical facility and in particular kids undergoing medical care. The goal was to interact with as many kids and family members and for the purpose of entertaining and educating them about model railroading. The show remained open from 1;00 pm to 5:00 pm. There were 55 residents of the facility at the time of the show. Though we only realized about 20-25 attendees, there were several benefits to our carrying out the program. There were 14 NRMRC members in attendance. Set up began at 11 am and was completed by 12:30 pm. There were no major issues with set up The tables provided by the facility were sturdy and stable and provided a very good platform for the layout. The room provided (Community Room) was larger than anticipated and very comfortable and well suited to our needs. Tear down took about 30 minutes and went smoothly, including returning the room to its original set up. Upon initial testing a track “dead” spot was detected at the yard throw. The solution proved to be in replacing a missing rail joiner. After several hours of operation, numerous “shorts” were noted. These proved to be train operator errors. The staff at RMH was excellent, very accommodating and gracious. They have offered that we are welcome to use the facility for meetings or other functions in the future.Thank you cards will be sent to our main contact Clay Ragan and his assistant Stephanie. We also had an opportunity to discuss potential future projects for the club. One of the attendees operates a Kid’s Charity that displays animated dioramas at facilities in the area. This sparked discussion about our potential involvement. The morning began with about half of the member attendees meeting at Elmo’s diner for breakfast/brunch. This provided great social interaction and an opportunity for idea sharing. Of course during the show itself there was a lot of train running and conversation. Thank you Geoff and Ryan for providing food for this event. It was certainly appreciated and enjoyed by all.